Wörthersee and the enchanting city of Klagenfurt. Take exit 317, for Klagenfurt-West. Then take the exit for Klagenfurt-Wörthersee / Minimundus and you are only 300 m away from our entrance. Take the exit for Klagenfurt-Wörthersee in the direction of Vienna, Graz. Then take the exit for Klagenfurt-Wörthersee / Minimundus and you are only 300 m away from our entrance. 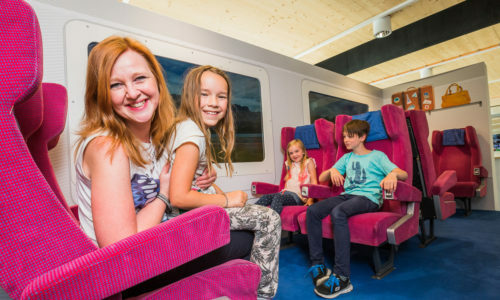 Travel by train to “KLAGENFURT WEST” station. From there it is just a few minutes on foot to the Minimundus entrance. You can find the ÖBB timetables here. Klagenfurt airport is only a 10 minutes’ drive from Minimundus. 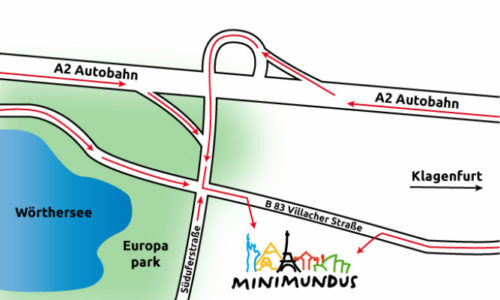 You can use public transport to get to Minimundus. Information on Klagenfurt airport can be found here. The Stadtwerke Klagenfurt bus lines 10 and 20 both stop at the “Minimundus” bus stop, which is located just a few metres from our entrance. Timetables can be found on the Stadtwerke Klagenfurt website. The ÖBB and Postbus “Minimundus” bus stop is also located just a few metres away from the Minimundus entrance. Timetables can be found on the ÖBB and Postbus websites.